There is an ever-growing variety of unique and beautiful semi-precious gemstones on the market today, but few are as stunning as seraphinite. In fact it's one of my favorite stones to work with when I'm making my own beaded jewelry, and as a retailer I find there is a growing demand for seraphinite by consumers. 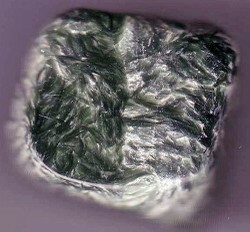 This dark green stone, a member of the Chlorite group of minerals, is typically an olive-green color with feathery wisps of silvery-white running through it. The stone is named after the seraphs (winged angelic beings) because of its beautiful feathery appearance - hence it is often also referred to as "The Angel Stone". Seraphinite is lovely when used in jewelry, either set in precious metals or as part of creative beadwork designs. Here you will find more information about the stone as well as have the chance to shop for amazing finished jewelry featuring it, as well as for supplies for creating your own designs with "The Angel Stone" at home. Image above: A piece of seraphinite. Source: Bob Richmond on Flickr, licensed under Creative Commons Attribution 2.0 Generic. 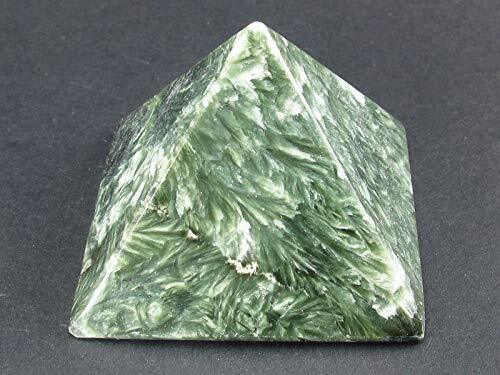 Seraphinite Clinochlore Pyramid From Russia - 1.5"
Some Introductory Information on "The Angel Stone"
Seraphinite is a member of the Chlorite group of phyllosilicate minerals. It is mined only from a small region of eastern Siberia in Russia, near Lake Baikal, and Russian mineralogist Nikolay Koksharov is generally credited with discovery of the material. The limited sourcing of Seraphinite is what makes it one of the pricier semi-precious stones on the market today, but one can find it more and more frequently today for sale in jewelry stores and at gem shows around the world. The stone exhibits the property known as chatoyancy, which gives it mesmerizing optical reflective qualities. Silvery lights glimmer and dance throughout the material as you look at it from various angles and different lights. For those who believe in the metaphysical and healing properties of gems and stones, Seraphinite is considered quite powerful. As its name would imply, it can be used to establish a connection to the angelic realm and is powerful for self-healing and regeneration. It is a strong purifying stone that can help one find his or her higher path in life and to feel a greater sense of wholeness and well-being. For its curative properties, Seraphinite is believed to be especially beneficial to the nerves and brain cells, for purifying the blood and eliminating toxins from the kidneys and liver. This gorgeous polished pyramid of seraphinite is 3.8 x 2.2 x 4.1 inches in size. It's perfect for using in meditation, healing, or simply adding to your gem and crystal collection to admire its beauty. Seraphinite Gemstone Handmade .925 Silver Necklace 18"
B0240 Seraphinite 925 Sterling Silver Plated Earrings 2"
B0415 Seraphinite 925 Sterling Silver Plated Earrings 2"
The videos below will allow you to learn more about seraphinite's unique properties, as well as see the stone up close in all of its mysterious beauty. How do I know if I'm buying real seraphinite? I've seen plenty of fake stones listed for sale myself, often made from less expensive materials such as green or moss agate (which have some of the same light grey to dark green variations), dyed howlite, and green magnesite. Other sellers will "compress" chips and dust of "leftover" charoite together to make poor quality "stones" that are dull in color and lacking true vibrancy. So, how can you know if you've got the real thing or not? Be sure to look for strong, sharp crystal patterns as you should see in real seraphinite, and the chatoyancy effect: fakes made from agate, howlite or magnesite will not exhibit this unique property! The image here are some of the seraphinite beads for jewelry making in my collection: pieces I know are the real thing. The color is always a consist olive to dark green. If you see something described as seraphinite that is a strong "acid-y" green or even bright blue-green, without patterning as you see here, be extremely wary. What Stones and Materials Complement Seraphinite Best? 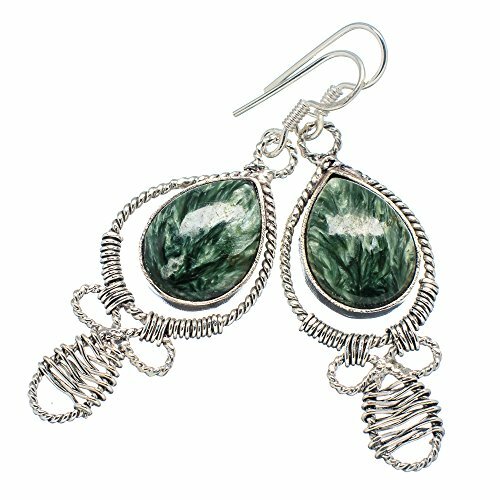 If you are a jewelry designer, Seraphinite can be a wonderful stone to work with. Seraphinite's dark green, olive colors work well when combined with numerous other semi-precious stones such as zebra stone, tree agate, many varieties of jasper, onyx, hematite, peridot, and of course Seraphinite's close purple "relative", charoite. It also looks lovely with freshwater pearls of various shapes, colors and sizes. It is more common to see seraphinite combined with silver than with gold, to pick up the silvery/grey lights of the stone. Of course you can also go for a strong contrast and use complementary colors to set off the seraphinite boldly. The image here is one of my favorite necklaces, featuring seraphinite set off with red garnet and yellow citrine faceted stones in sterling silver. Here's a tip when looking for seraphinite beads on eBay: if the price per strand seems too low to be the real thing, it probably is. Genuine seraphinite is not a stone you're going to generally find for anywhere under $10/16" strand - at least not unless you're talking very low quality and tiny beads! Quite often the price is much more in the $20/16" and (way) up range for larger, better quality seraphinite round beads, discs and small shapes. Faceted cut and larger specimens can be much more expensive. So just keep that in mind if you're trying to be sure to buy authentic stones and can't get to a gem show/bead store to examine materials in person. 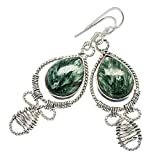 Where else can you find seraphinite jewelry and beads? Seraphinite on Etsy, a global handmade and vintage marketplace. Find one-of-a-kind, handmade seraphinite jewelry on Etsy! You'll also find slabs, stones and beads for use in your own jewelry work.